This newly seeded lawn area has been mulched with straw. Once the site is prepared and the proper grasses have been chosen, it's time to plant the lawn. The decision whether to seed or sod involves a number of factors. Assuming planting is done properly, the end result of a healthy lawn should be the same. Timing is critical to assure success when seeding lawns. Mid August to early September is the ideal time for seeding lawns in northern Illinois. April would be a second choice. Seeding in late spring through mid-summer often leads to problems as the summer heat slows or stops grass development of our cool season grasses. 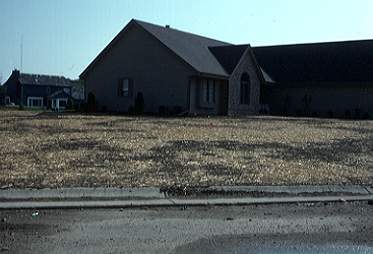 Dormant seeding, occasionally done by professional groundskeepers, is difficult and thus not suggested for homeowners. Seeding rates are found below. Exceeding rates may result in weak, spindly seedlings and potential disease development. Newly seeded grasses must receive adequate moisture to assure germination and early seedling survival. Putting down a light straw mulch can help prevent rapid drying and helps keep the soil in place until grasses are established. Use about one bale per 1,000 square feet. When sodding, purchase quality sod that has been freshly cut. Use sod that has been grown on a similar type of soil as exists on the site; most of northern Illinois has mineral soils so try to get sod grown on mineral soil. Install promptly with a properly prepared soil bed, identical to what is done for seeding. Stagger edges in a similar pattern as laying bricks. Avoid stretching sod or having gaps between pieces of sod. New sod should be watered thoroughly after installation, and then frequently enough to keep the sod moist until the sod is established. Water should go down through the sod to moisten the soil underneath for good root development. Mow newly sodded lawns on a regular basis so that no more than one third of the grass height is removed in a single mowing. A height between 2½ and 3 inches is suggested. Core aerating the lawn after the sod has firmly rooted to the soil will aid the development of a deep root system. Don't fertilize newly sodded lawns until the next suggested time in the normal fertilizing schedule; May and September are key times. If fertilizing only once a year, fall is the preferable time. Avoid over-applying nitrogen fertilizer, especially in spring or summer.